Nossa cabana Sunrise Cove isolada em Patoka Lake está pronta para você. Pegue uma xícara de café e relaxe na varanda longa coberta de 36 'e observe o sol da manhã brilhar no lago (exceto no verão). Recuperar o atraso em sua leitura na cadeira confortável no canto livro, ou conversar com sua equipe favorita em alta definição nas 4 TVs de tela plana (3 com a Dish Network). Lá embaixo há uma mesa de bilhar, pebolim, air hockey e pingue-pongue. Saia pela porta de trás e desfrutar de área de lazer Patoka Lake a quase 26.000 acres. Construa uma fogueira, faça uma caminhada (spray de insetos é imprescindível), ou pegue seu mastro e caminhe até o lago (a subida íngreme poderia ser cansativa para alguns atravessarem). Quando você voltar, mergulhar na banheira quente ou entrar no duplo pé-no chuveiro no banheiro principal. Além das atividades no lago, o cassino do French Lick Springs Resort fica a 15 minutos de distância. E o não-à-estar-faltado West Baden Springs Resort é apenas uma milha adiante. A sala de cinema com assentos estádio, um parque aquático gigante em-porta, um impressionante in-door pista de kart, vários restaurantes, um supermercado e farmácia também estão localizados na área de French Lick / West Baden. Afaste-se de tudo ou fugir para tudo de Sunrise Cove Cabin. What a neat cabin to stay in. Our three active boys enjoyed the outside life (hiking, making camp fires, exploring, fishing, chilling in the hot tub) and also liked the inside activities as well (pool table, ping pong, and games provided). We hiked to the lake several times, which keeps you in shape when you climb back up the hill. We appreciated how the owners maintained the home and the property. You can tell that they cared a great deal about their rental cabin. Everything was clean and was well stocked with most essential items. For us living in a city, it was certainly a pleasure to be able to look up at the night sky and see plenty of stars. We will be back again. Loved the cabin! Clean, well furnished (hot tub alone gets five stars), and best of all...secluded!!! Perfect getaway for our 18th anniversary. Thank you so much for sharing your home with us. We had an incredible weekend away at the cabin! The privacy and seclusion were just what we needed to get away from our busy lives during the week. 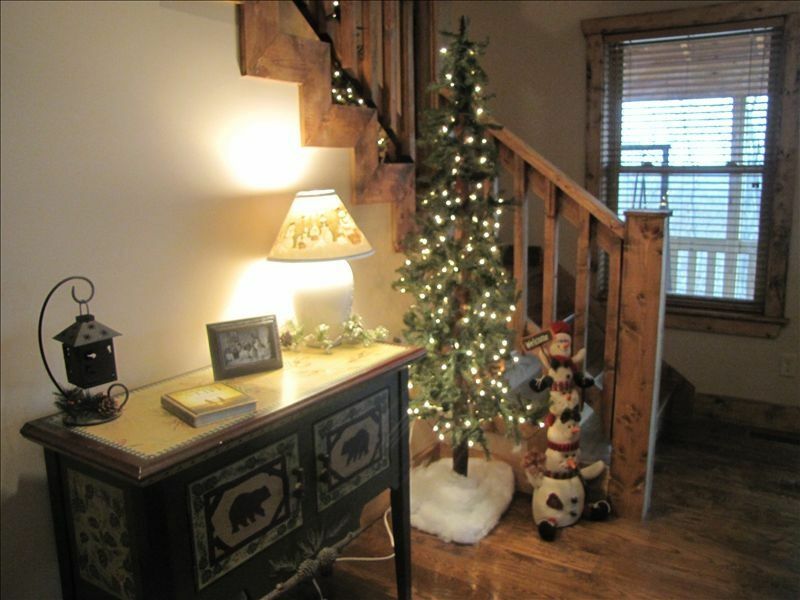 The cabin is very tastefully decorated and is well stocked with anything you will need for a getaway. The shower in the master bath was very relaxing, along with the hot tub outside, The king bed in the master bedroom was very comfortable. Although there were only 2 of us, the cabin would be great for an extended family getaway or even 2 couples. It will comfortably sleep 9. I wish we had more time to stay a few more days to really enjoy the cabin, or maybe to be able to return in the summer. I am sure it is beautiful when you can spend time outside! Thank you very much for a great getaway! We really enjoyed our New Year's get away. We did not leave the cabin/property (except for a hike down to the lake). Great fire ring area too. Perfect way to relax and enjoy the tranquility of nature. we loved it! it was clean and had everything we needed. would love to stay again. You drive through the back country roads to get there, and it situated between some metal homes and mobile homes, but off the road so much that you absolutely feel alone. The house was VERY clean--the cleanest place we've ever rented in the past 20 years. Everything was in good working order. They could use an upgrade on their hot water tank--not enough hot water to fill the garden tub for a bath, but the hot tub made up for that. I wouldn't count on several adults being able to take showers in the same time frame even if they were short. Everything that we needed was in the house. There were condiments in the fridge, basic cooking supplies and ingredients, some hot drink choices, movies, books, toiletries, laundry items, firewood, etc. It was very pricey, so we won't likely return, but after our son's death we needed the get away with the rest of our children for our first Christmas since his passing. It was perfect for that. We loved our trip and would highly recommend to anyone who wanted a get away. Área French Lick / Patoka Lake.